My in-training form as a Digimon. As you can See, he looks cute and tender... please no yiff with him... for that you have Ryudramon. And now, to describe his attack! Fiery Roll is a Digimon version of Flame Wheel of practically any fire Pokemon, he spins into a ball of fire and tackles the enemy. My main form as a Digimon! Ryudramon a cute variation of Shoutmon's Data! Practically with the same personality, he is a cool warrior. His sword can be split in two so he wields a double sword. Metal Slash: Uses his sword making a sharped air slash at the enemy if its the full sword, if it's slited in two, it makes a "X" shaped slash with the edge. Burning Slash: The sword becomes cloacked with fire and Ryudramon slashes at the enemy with brutal strength. 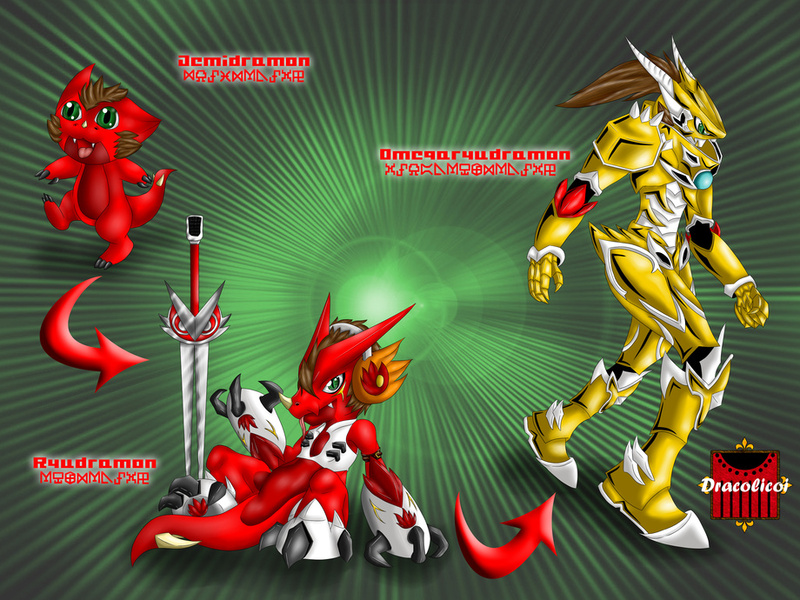 Heavy Metal Damashi: Ryudramon's version of Shoutmon's Rock Damashi. Basically makes the same thing creating a musical note of fire that he tosses at his enemy. Ryudramon also can make a Hypershout by screaming into the mic in his sword, it doubles it's power if it is splitted in two blades. Power Metal Damashi: Is a more powerful version of his Heavy Metal Damashi, similar to OmegaShoutmon's Hard Rock Damashi. Xros Slash: I slashes in an "X" pattern at the enemy with his double sword. Thrash Metal Explotion: From the sphear in his chest, a fiery energy rushes at the enemy making an explotion at contact. Omega The fusion: Exactly as OmegaShoutmon's attack, he covers with an aura resembling Omegamon and takes down at the enemy. Demidramon, Ryudramon & OmegaRyudramon © Me! what's his champion gonna be? Ohh hehe you'll have to read my fanfic to know it... if you don't know how to read spanish then it would be difficult hehe. But if you wanna know... His Champion form is "Nidhogmon"
Don't worry... I know if someone who knows spanish and english like it enough will ask me to translate it!